When you are looking to remove a tree on your property, a permit may be required and your replacement tree will need city approval. The experts at Greenbloom Landscape Design can help you obtain the right permits and have your trees removed and the new ones replanted without you needing to worry. When Do You Need Permission to Remove A Tree? The tree is on the street. The tree is in an area that is regulated under the Ravine and Natural Feature Protection By-law. The tree on your property has a diameter of 30cm or more. Are There Any Other Instances That Require Permits? Demolition, construction, alteration or replacement of buildings, driveways, sidewalks, patios, retaining walls, decks, raised gardens, or sheds. Installing large stones or boulders. Altering the grade of your property. Applying or disposing of any substance that may affect the health of the tree. Cutting, crushing, breaking, or stripping roots, branches, and the trunk of the tree. Nailing or stapling anything to a tree. 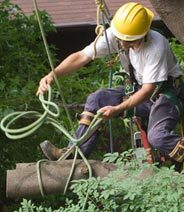 Stringing cables through or installing lights on a tree. What Are the City By-Laws for Tree Removal? Toronto Municipal Code Chapter 813 deals with trees and can be found here. What Tree Types Can I Replace My Removed Tree With? What Do I Do About A Damaged or Diseased Tree on My Boulevard? Contact 311 in Toronto and they will address your concerns for you. How Do I Remove A Tree from My Boulevard? Contact 311 in Toronto and they will discuss it with you further.